Wow, it's hot! After our holiday we have a lot of orders to process but the heat is affecting our computer equipment; yesterday the router switched itself off, overnight the computer shut-down and required a reboot. We also have the electricians here again to continue the building work, so may lose power because of them. But all current orders have been printed off, so they can be processed off-line, despatch will probably not be today, though. For those who ordered the premium Limited Edition Machin 50 Prestige Stamp Book, they were received today after Royal Mail production delays, so we should be able to include them as well. 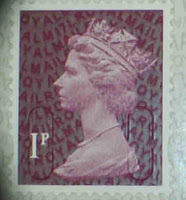 1st M17L MSIL on SBP2 - Padlock booklet of 6 (packing date not known) - this is the same stamp as in the Machin 50 retail booklet but that was on SBP1. Machin 50 Post and Go Collectors sets and 1st class strips from Post Office SSK machine. None of the above will be added to the webshop until we have cleared current orders and done some housekeeping! Thank you for your patience - updated: see pictures and links to the shop here.